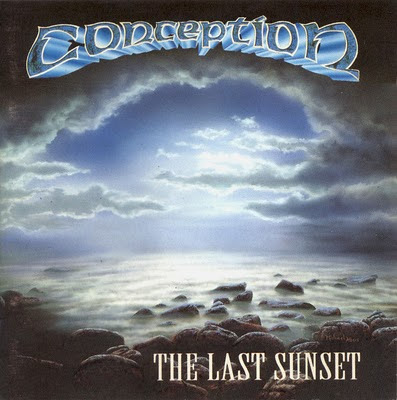 At first released as an indie-album, "The Last Sunset" ler to a contract with Berlin-based label Noise Records - more than deserved, because what CONCEPTION is offering us here is slightly progressive Melodic Metal of the highest level! Borne by Roy Khan's unique voice and Tore Шstby's filigree, partly flamenco-influenced guitarwork the Norwegians are giving us a ride that you do not find often. 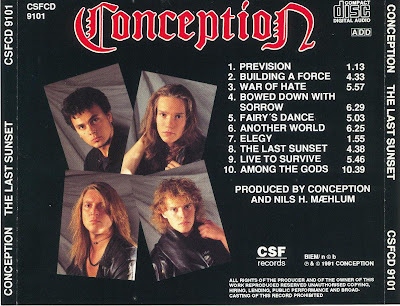 CONCEPTION also are a bit rougher and more experimental than on the following albums, but this also fits very well, as well as they do not orient them on any given standards, but have the courage to use different harmonies, like the ballad "Bowed Down With Sorrow" proves impressively. But there is still one stroke of extra genius, more then ten minutes long, at the end of the album, titled "Among The Gods". This song might very well be the best thing that CONCEPTION ever has done, thundering guitars meet pure flamenco, very varied arrangement with another brilliant vocal performance by Khan - there can be only one word for it: GENIUS!